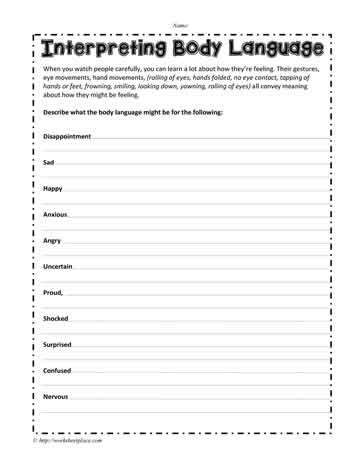 Body language worksheet. When you watch people carefully, you can learn a lot about how they?re feeling. Their gestures, eye movements, hand movements, (rolling of eyes, hands folded, no eye contact, tapping of hands or feet, frowning, smiling, looking down, yawning, rolling of eyes) all convey meaning about how they might be feeling. Describe what the body language might be for the following: disappointed, embarrassed, happy, bored, interested, angry, annoyed.